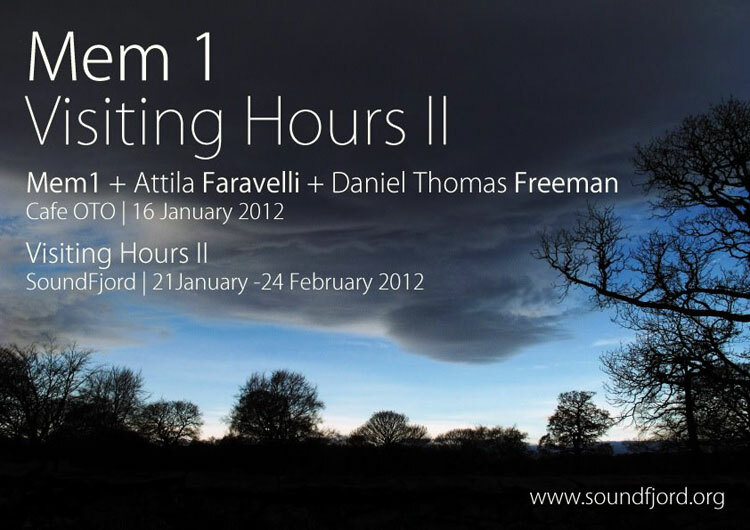 SoundFjord is delighted to present an evening of new audio work by the US-based electro-acoustic ensemble, Mem1 (Mark and Laura Cetilia) and special guest performers Attila Faravelli and Daniel Thomas Freeman (Rameses III). The evening will be a showcase for Mem1 to present audio work created during their Visiting Hours residency/exhibition at SoundFjord. The work itself will document Mem1’s experience of London and will utilise location recordings, captured radio spectra and recordings made with their musical instruments (cello, voice, and analogue electronics, as well as custom software/hardware that allow for real-time manipulation of these sound sources). For their associated AV installation at SoundFjord, the audio will also intertwine with locally recorded video footage. Attila Faravelli will perform works with prepared speakers. Daniel Thomas Freeman will unveil new works for violin, keyboard, tuned percussion and electronics. Daniel will also perform pieces selected from his acclaimed debut album, The Beauty Of Doubting Yourself (Home Normal, 2011).